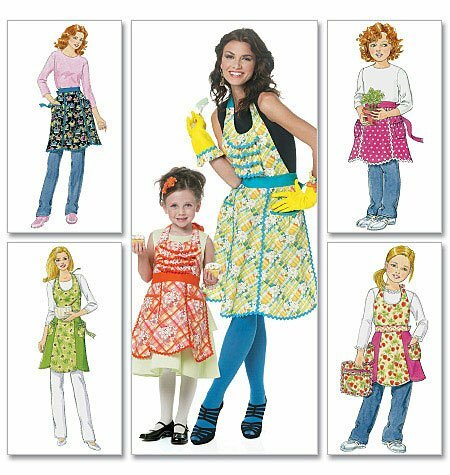 APRON, POTHOLDERS, NAPKINS, NAPKIN RINGS, PLACEMATS, TOASTER COVER, INSULATED SOFT COOLER: Apron A; Contrast pocket, straps, top and ruffles. Potholder B: Two 71/2"W. x 71/4"L. Napkin C: Two 151/2" Squares. Napkin Rings D: Two 2" Squares. Placemat E: Two 141/2"W. x 12"L. View B,E have contrast bands. Toaster Cover F: 13"W. x 9"L. x 51/2"D.; self lined and contrast bands. Insulated Soft Cooler G: 12"W. x 12"L. x 5"D. View B,E,F,G have contrast appliques. Designed for lightweight woven fabrics. 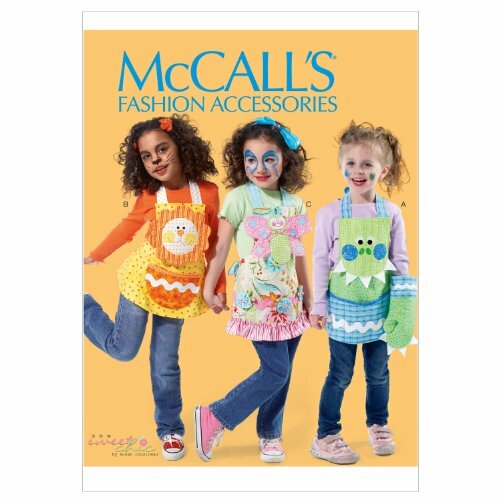 SUGGESTED FABRICS: Cotton/Cotton/Blends. Interfacing B,G: Batting. Interfacing D: Sew-in. Interfacing E,F: Fleece. Lining G: Insul-Shine, Reflective Insulated Lining. A - 45 - 11/4 yds. NOTIONS: A: Polyester Fiber Fill. B,E,F: Embroidery Floss. G: 1/4 yd. of 3/4" VELCRO Fastener Tape, Embroidery Floss and Polyester Fiber Fill. 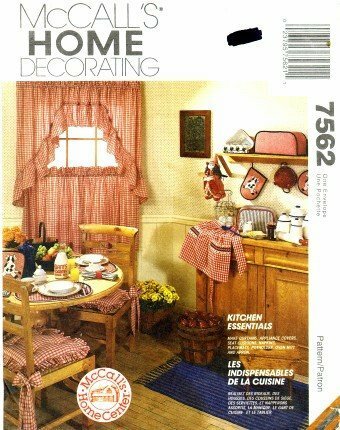 McCall's 3560 Home Decorating Sewing Pattern Kitchen Accessories: Cook up a retro look for your kitchen. 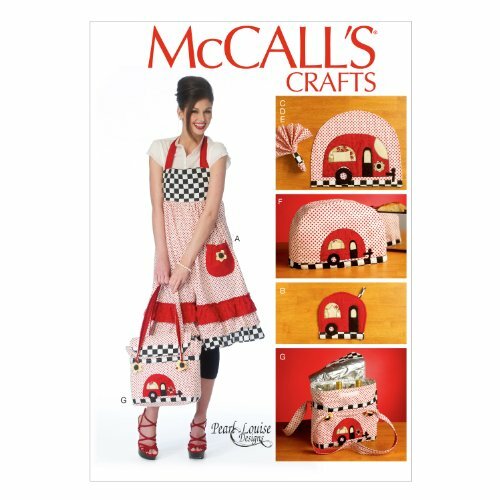 Make a few special items: organizer, looped towel, potholders. Try the new Flex-on Quick-Tach tapes and rings for your window treatments. 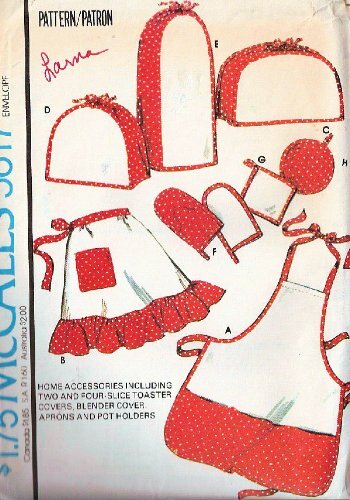 You can also make an apron and a plastic bag holder. 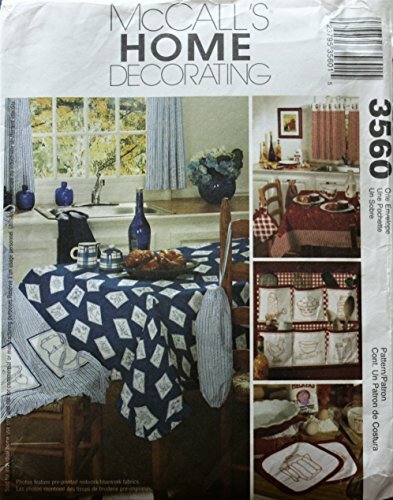 Make curtains, appliance covers, seat cushions, napkins, placemats, pot holder, oven mitt and apron. SIZE RANGE: One Size Only. 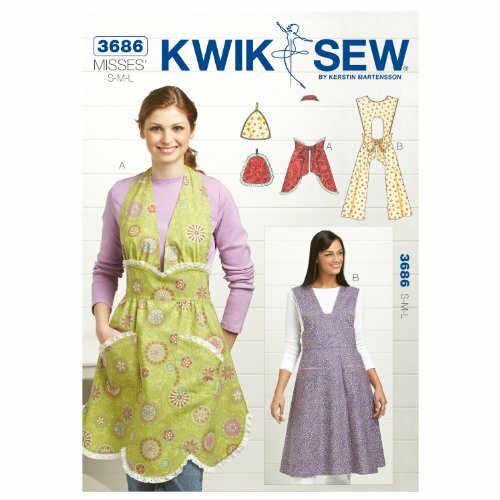 Kwiksew Sewing Pattern. 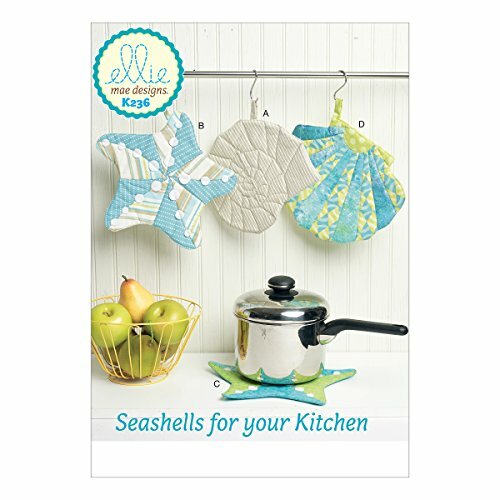 These adorable sea shell potholders are so much fun and easy to make! All views have hanging loop. Make a few for yourself or to give as gifts.